“What a difference a day makes”! Well, we didn’t get the sun and the flowers like in Dinah Washington’s song but more like storm and showers. For the ones who don’t remember Dinah, Amy Winehouse made a more recent version of the song. 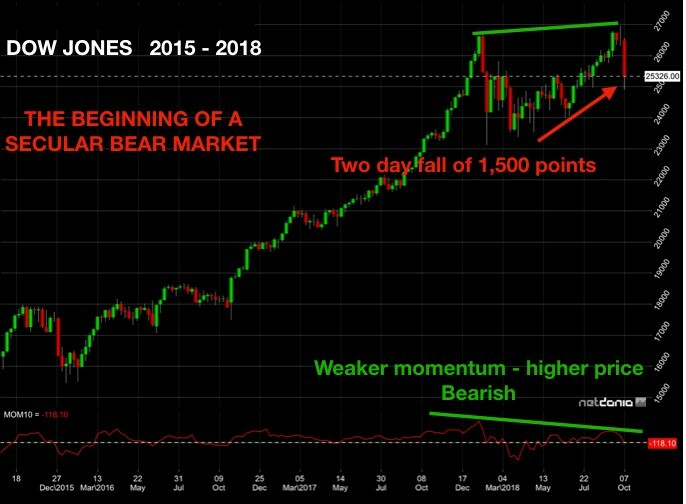 Last week I warned investors again, in the strongest tone possible, of the risks in markets. So what triggered it? Was it the Fed’s interest rise? Or was it the trade war with China? Or maybe it was Kavanaugh? With 79 market indices down last week, my warning was certainly timely. 12 markets were down more than 5%, led by Shanghai, Egypt, Taiwan, and Stockholm. As I have been stating many times, market timing is a mug’s game and very few have got the gift of Nostradamus. So the key isn’t to pick the tops or the bottoms but to understand risk. With global risk at historical extremes, anyone trying to chase these markets higher is playing a very dangerous game with the risk of losing it all. You can argue that a 4-5% fall in markets that have gone up by multiples since 2009 is totally insignificant. But most investors are driven by greed and not by prudence. For almost 10 years this bull trend has had no severe, sustained correction so being a perma-bull has been the right thing.